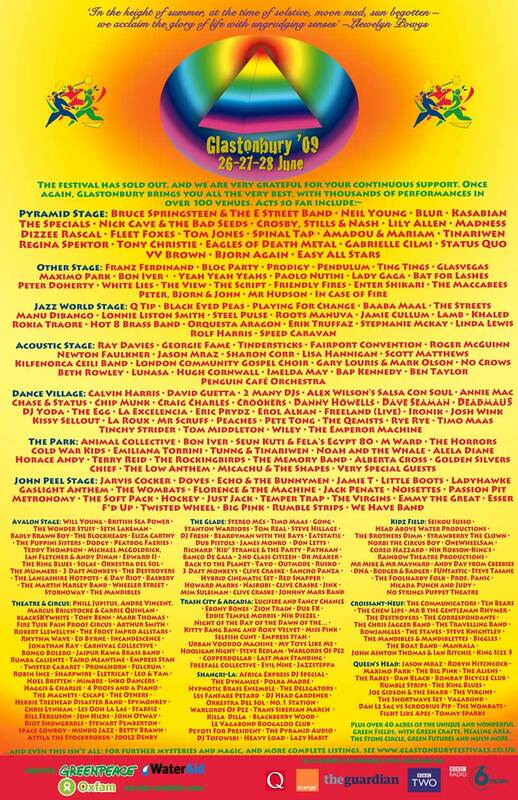 After the triumph over adversity that was Glastonbury 2008, expectations were running high for the 2009 Festival. The ticket deposit scheme proved to be a successful and popular initiative, helping the Festival to sell out eight weeks before gates opened. When they did, the crowds flooded through them in droves: by the Thursday morning, a record number of Festival-goers (90,396) had already set up camp on Worthy Farm’s rolling hills. Excitement and anticipation fizzed throughout the site, and this year’s event certainly lived up to it. With no main stage acts until Friday, markets heaved and lush green fields teemed with cider-sipping sunbathers. But gloomy forecasts predicted a monsoon to engulf the Mendip Hills and, sure enough, Thursday evening saw the day’s clear sky darken with some ominous-looking storm clouds. Lightning strobe-lit the valley and a torrential downpour did its best to drench fairy wings and dampen spirits. But umbrellas were opened and spirits remained impenetrable. The clouds moved on for good, leaving only some muddy puddles and smug welly wearers in their wake. Music-wise, Maximo Park kicked things off with sweaty panache in the Queen’s Head in the new William’s Green area on Thursday afternoon, while East 17 got the party started in the Dance Lounge in a rabble-rousing, mass tear-inducing rendition of Stay Another Day. That evening, though, news of Michael Jackson’s untimely death swept through the crowd and tributes celebrated his music throughout the weekend; Friday saw Lily Allen perform her brilliant Pyramid Stage set wearing one white glove while The Streets’ Mike Skinner covered Billie Jean in homage on the Jazz/World Stage. Despite Jackson’s death, the mood on site remained upbeat. On Friday morning, Abba parody Björn Again opened the Pyramid Stage, and from that point, the performance highlights came thick and fast. Fleet Foxes’ sweet harmonies serenaded a sun-dappled afternoon throng; Little Boots and Lady Gaga dazzled; Ray Davies and Neil Young delivered classic sets. Rolf Harris’ Saturday performance jammed the Jazz/World stage; Dizzee Rascal marked his arrival as a bona fide star at the Pyramid; Florence And The Machine rocked a rammed John Peel Tent and the frenzied excitement that consumed the crowd watching Pendulum on the Other Stage was only surpassed by those cheering on The Boss as he broke into Born To Run in his headline set on The Pyramid. Sunday’s sing-a-longs came courtesy of golden oldies Tom Jones and Tony Christie. Nick Cave’s tremulous sun-down set was upstaged by a plucky – though unsuccessful – would-be gatecrasher attempting to defy the fence by flying in via microlite, while later, The Prodigy tore up the Other Stage. But it was hard to top a reunited Blur’s return to Glastonbury. Hailed as the best Pyramid set in an age, the unfaltering show and its ecstatic reception even moved Damon Albarn to tears. Emotional and elated, he wasn’t alone. Outside the main stages, the Festival was more vibrant than ever. 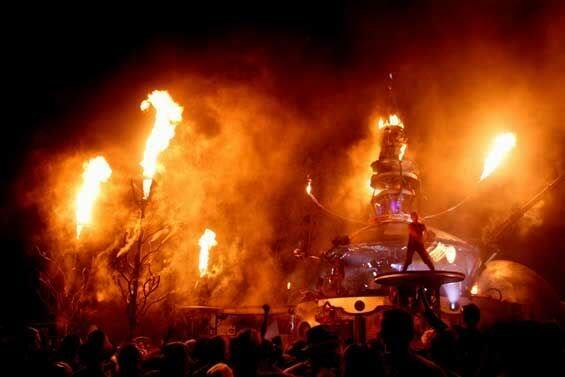 For the first time, Arcadia was given its own field and fascinated with its fire shows and industrio-decadence. Shangri-la, now in its second year, impressed with an enthralling retro-futurist virtual world of snaking corridors and neon-gilded surprises. Late Friday night, in Club Dada, Lady Gaga’s riotous secret gig was suitably thrilling. It was an unexpected treat that was hard to beat, even by Bruce Springsteen’s unscheduled stop on stage with New Jersey rockers’, Gaslight Anthem at their John Peel Tent show. 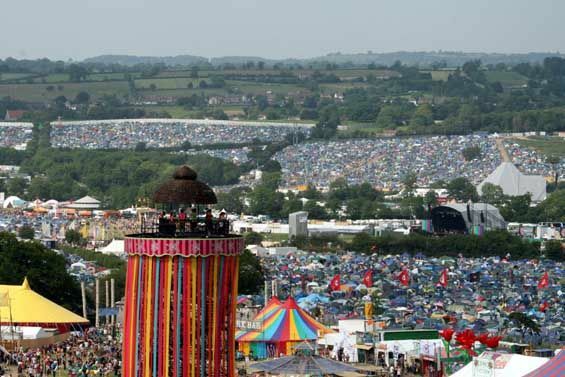 But there’s always more to Glastonbury than music and this year the Theatre and Circus areas were home to some spellbinding performances of a gloriously alternative ilk. Cirque du Soleil’s Fulcrum impressed with their power and lithe acrobatic skills, while The Fire Tusk Pain Proof Circus brought the classic thrill-seekers’ circus show into the 21st century with awe-inspiring extreme stunts. In the Cabaret Tent, a blistering bill of diverse acts – from the political capers of Mark Thomas to the sparkling silliness of Adam And Joe and the sheer genius of Spymonkey’s Monty Python-esque physical comedy – ensured funny bones were well tickled. With the sun high in the sky, The Park came into its own this year. Perched on the hill it was the place to escape the busy hubbub of the Festival and indulge your senses in the unusual. The BBC Introducing stage hosted a blistering array of up-and-coming talents, while the natural amphitheatre of The Park’s main stage proved the perfect place to relax and take in eclectic acts such as Bon Iver and Animal Collective. Making its debut, the Free University Of Glastonbury entertained with its mind titillating lectures, while The Rabbit Hole further established itself as the home of unpredictable zaniness and anything-can-happen surprises. On the worthy causes front, this year saw the Festival add its support the White Ribbon Alliance’s Million Mums campaign. Charity patron, Sarah Brown, and Ambassador, supermodel Naomi Campbell, both dropped in on the Festival to give their support to the charity’s aim to end the needless deaths of women in childbirth. At the charity’s Festival HQ in the Park, over 10,000 signatures were collected in aid of the campaign. 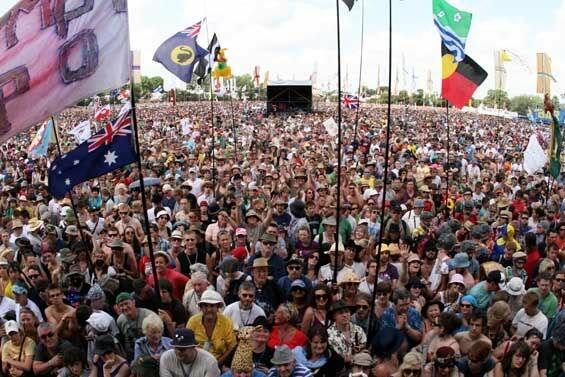 Michael Eavis later hailed 2009 as “the best Glastonbury ever”. He has, of course, said that before. But this time, few saw any cause to argue. Attendance 135,000 Weekend Tickets, 37,500 passes (for crew, performers, stewards,traders etc,) and 5,000 Sunday Tickets. Ticket price was £175.